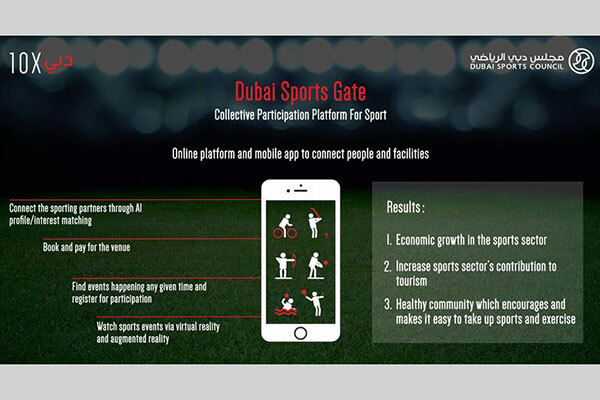 Dubai Sports Council (DSC) has introduced an interactive portal that serves as a guide to all sports events which take place in the Emirate aiming to develop the sports sector under the umbrella of the Dubai 10X initiative. The Dubai Sports Gate initiative is part of 26 initiatives submitted by 24 government agencies in Dubai, which were approved by Sheikh Hamdan bin Mohammed bin Rashid Al Maktoum, Crown Prince of Dubai and Chairman of the Board of Trustees of the Dubai Future Foundation (DFF). A panel of experts reviewed more than 160 ideas submitted by 36 parties for implementation in less than 365 days. "The project will encourage people to be more active and adopt a healthier lifestyle, the Gate or the application will allow users to register and participate in any event. It also enables them to watch championships that take place in Dubai and provide them with updated information about service providers and specialised stores that sell sports equipment,” added Hareb. The implementation of the project is set to take between 18-24 months. Dubai Sports Centre has already developed a comprehensive project plan to implement the Dubai Sports Gate project in partnership with many related entities.